It's good being able to enjoy the long Summer days. At least it would be if I was home more often! Last week I was lucky enough to finish early at a client and arrived home about 4:00pm. This meant we were able to visit the local river with friends and take a dip. The interesting thing about this river is that it looks little bigger than a creek. Yet appearances are deceiving. Locals tell me that they don't know anyone who has actually touched the bottom! There was broad rock ledge on the river bank on which the smaller children dabbled with a couple of the older - more responsible - children and then there was a long drop underwater. At various points along the river are rope swings that have been set up by locals over the years. Eric is showing us one way you can do this. Run, swing, let go, hold your nose and "Kersplash!" 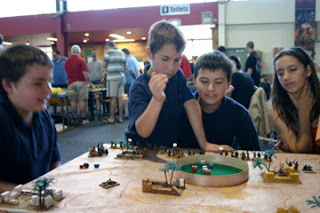 20 years ago I travelled about 8 hours North from Melbourne and attended the Canberra Wargames convention "Cancon" to promote a game I had written and published. Lana attended the convention accompanying her sister and brother-in-law hoping to perhaps see some of Canberra and have a bit of a holiday. I was approaching all and sundry - wearing a white suit, hat, gloves and brandishing a cane - enticing many to join in our game. Lana couldn't help but succumb to my charms (or just felt pity on me) and joined in a game or two. The rest is history. This weekend I visited the convention again, this time with the three boys and one of their friends. In this photo they are participating in a demonstration game, controlling groups of Bedouin tribesmen intent on stopping the French Foreign legion's relief of their fort. Sam Kekovich is the spokesman for the Australia Day Party. This isn't a political party. It is a promotional tool for the Australian lamb industry and is very funny. The home page features a video of Sam explaining why it is so important to vote for a real Australia Day party which MUST include lamb on the barbie. There is also a quiz to determine your level of "Australian-ness". I only scored 5 out of 10 on my first go, which resulted in a video of Sam castigating such a pathetic result. Ah well. Some more research is needed. Today we celebrated the Feast of St Paul the First Hermit. The Bishop of Wollongong was the main celebrant. Clare likes to have a copy of the "Calendar of Events" in her hand during Mass which has a photo of the statue of Pope John Paul II on the front page. When Bishop Ingham put on his Mitre (the special Bishop's hat) during Mass Clare's eyes widened and she quickly looked at the photo, then at Bishop Ingham and back to the photo. "It's him!" she whispered to me. "No, that's Bishop Ingham. The photo is of John Paul II." I explained. Clare frowned at me, ""No. It's him. Look!" and she showed me the photo again. After Mass we met the Bishop and related Clare's comments. He smiled broadly and said, "No. That's the Pope. He is a Bishop in charge of the whole world. I only have the Diocese of Wollongong." Clare smiled sweetly and the Bishop gave her a special blessing. On an unrelated note, when Clare and I were standing together in the kitchen, Clare said, "I need to learn to say Jofus properly." 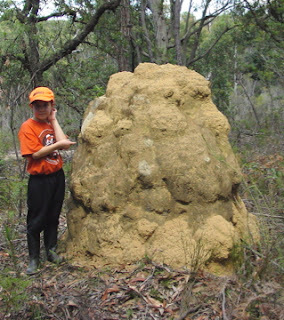 "But I can kill ants well," she said as she squashed a really little ant. We live very close to the "bush" - land which is either State owned or just undeveloped. Towards the end of a busy day I am prone to announce "We're going for a walk. Let's go." Rose varies on her ability (or willingness) to walk all the way and we have many variants of walking trails. Some have more slopes, some are longer or shorter, others are more village or more bush tracks. Plenty of variety depending on the mood. Lana and a nearby homeschooling Mum go for more of village walk with few "uphills" as well as picking up the mail from the General Store. 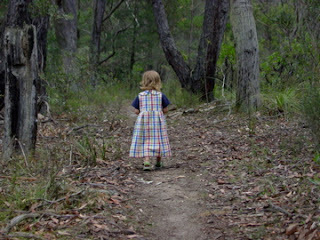 Ariel goes for a walk with a couple of the homeschooled girls on a bush walk. Sometimes they don't concentrate and discover new tracks and trails. With no little ones their options are broader. One day they weren't concentrating and ended at a dead end with only bike tracks leading off in different directions. So off they went down one this day and another next day. They next tried a dried up creek bed. They pushed their way up to the top of a hill and as it had rained the previous day, Ariel's socks which had started white ended up not white at all. As always this allowed me to use the ants as an example. 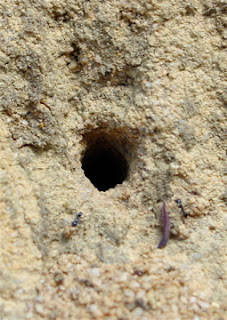 The ants build up on previous works much like successful families and countries do. It is compounding in action. Much of current civilisation is built upon the shoulders of those who came before. It may appear as though we are alone and it is only ourselves that have done such great things, but like the top photo of Rose, we are not alone. Just ahead of Rose were the rest of the family and I was following behind. What will your legacy be for the future? Money isn't the most important legacy. It should be something which is longer lasting. Sometimes the legacy is something you will not even know until we learn so many things after death. That comment or chance meeting you don't even remember may have repercussions that affect many future generations. Now isn't that food for thought from a walk in the woods? Maureen Wittman has posted a lovely story about her experience with a tough small Nun when she was attending Primary school. 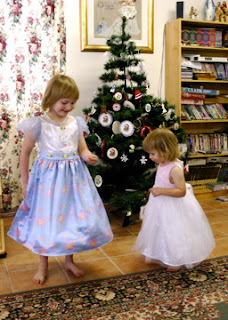 We have contact with a number of good nuns who are either involved with the homeschooling groups, or are cloistered nuns that invite us to their celebrations when any of them make professions. One of our readers emailed me with a finance question and I have been providing quite a bit of financial advice lately, so I figured it was time for another useful financial post. Do you realise the impact of compound interest? It is really powerful and understanding it properly should give you more insight into making some financial decisions. Compound interest is the term describing the ability for an amount to grow as interest earned is calculated on the accumulating value. For example, $100 earns 10% a year. At the end of year one, the value has grown to $110. Year two $121, year three $132.10. So by the end of the third year, the original $100 is now not just 30% bigger, but 32.1%. Compound interest! If you have a mortgage at 7% interest, is it better to use the extra $100 on the mortgage or put into an investment? This $100 is worth $206.10 in ten years. That means you will be saving $106.10 in interest by putting that into the mortgage. If you look at a credit card rate of 18%, it is worth $523.38 resulting in an interest saving of $423.38!! If the money was put into any investment, the returns would not only be taxable, but to achieve the same returns would be very high risk. Paying out your debts is probably the best investment you can make. If you have no debt, compound interest works in your favour. The earlier you begin putting money into savings or investments, the longer it has to grow. Note how the $100 doubled after 10 years with nothing extra being done? If you can avoid the downsides of compound interest in debt and gain the benefits of compound interest in savings and investments you have learned the secret. The bottom line? Pay off debt before considering investing. Use the financial formulas in Excel or other spreadsheets and compare the different scenarios. Wisegeek has a fascinating page of photos illustrating what 200 calories looks like using 71 photos of different foods. Lana, Ariel and I tried to imagine the varying levels of "fullness" you would experience eating that quantity of food. Surprisingly many of the items would probably be similar. 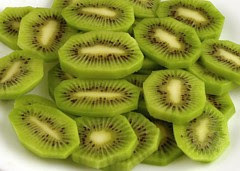 Although eating this much Kiwi fruit would probably leave your mouth pretty numb. Lana is currently creating a "Memory Book" of her Cross stitch work. Each page has a photo or two of the finished work and a small story of when she started and finished the work and any relevant stories associated with the work. Back in September 2005 we reported on the Hummel Apple Tree Children. The above picture is of them framed. As part of her Memory book Lana did some more research on the artist, M..I. Hummel and discovered a fascinating tale. You can read much more details at www.mihummel.com, but here is a summary. Sister Maria Innocentia Hummel was born in the small village of Massing, Germany in 1909. She studied art in Munich and after graduating she joined the Franciscan Order deep in the German countryside. M.I. Hummel taught art at a local school and continued to pursue her own artwork. Her artwork was published in books and as art cards. These made their way to Munich. A figurine company wanted to create figurines from her drawings and an agreement was made in 1935. The figurines became very popular especially with the American G.I.’s as souvenirs after World War II. Sister Hummel contracted tuberculosis and died November 1946, at the age of 37.